I’m a person on the left and I’m gay and thanks to marriage equality, I’m married too. I’m also clergy. And so my defense should make various sides of these issues unhappy. But since I see so many articles on the left that call for taxing the churches I thought it would be worth clearing up some misnomers. A) “What is particularly egregious about the tax benefits going to religious organizations is that they receive these benefits, ostensibly, because they are charities.” No, they are receiving this tax benefit because they are a non profit. But looking at percentages won’t help get a full picture of the charitable support. 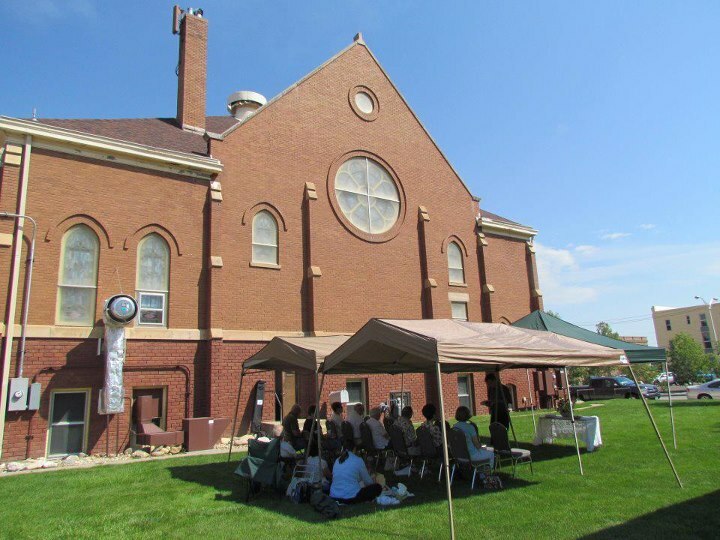 I served a church, First Congregational, in Sheridan WY. As a % of it’s budget, it is true that operating expenses took up the bulk of its financial resources. But it also houses the local soup kitchen, the only one in town. It provides volunteer hours to keep that kitchen going, five days a week. As a downtown congregation, it is one of the first stops, for the homeless and economically marginalized to connect to resources. And it was a community for the homeless. And I knew which churches provided for the community. In our town, direct person to person contact and support happened through our church, the LDS, and the Catholic Church from helping with gas money to paying the electric bill. And unlike some non profits, our support involved no paperwork, no strings attached. That opened the door to help folks who could not negotiate the professional social service sector and their accompanying rules. Is it possible that churches can do no strings attached support? Yes. In fact, the evangelical congregations, never helped with the soup kitchen. Why? There was a simple rule we had. No proselytizing allowed. You fed folks to feed them, not because you had some product to peddle. Homeless or not, folks know when they are somebody else’s project for evangelizing and they no more appreciate it than anyone else does. Our church also housed several Girl Scout troops and Alcoholic Anonymous. And we were a no harassment zone for folks just looking to loiter without being harassed by the police. Given our location downtown, that was important. So you cannot measure any of these services by % of budget. And yet their impact is felt, for the better, in the wider community. Which is part of the logic of shielding churches from taxes. Now some argue that there is a transaction happening. One is paying for salvation, for counseling, for support groups, for any number of services when you join a church. And with that language, any non profit can be censured as most provide some kind of service when joining. I even got a t-shirt for joining the Human Rights Campaign! B) The article states “folks affiliated with ties to religious organizations also overwhelmingly support the Republican Party” So it seems as if all of us are indirectly subsidizing conservative organizations. But that only can be done by cherry picking stats about the LDS and evangelical churches. You find a 50/50 divide among mainline Protestants and Catholics. Among American Jews you find an overwhelming majority identify as Democrat. The same with Muslims. Of course you can do this with any non profit. The NAACP is a non profit, whose members primarily identify as Democrat. The NRA is a non profit, whose members primarily identify as Republican. Unless you are seeking to do away with the very idea of a non profit, it will be the case that you are shielding groups from taxes that you as a reader disagree with. Or will we cherry pick non profit status based on politics? That is all but the stated goal. What folks have in their minds is they want to nail Joel Osteen, they want to go after these large mega churches, who appear to be an arm of the GOP. The problem is that if you tax churches, these groups have the money to hire whatever accountants they need to shield themselves from liability. And taking some % of their money is of no consequence. Here’s the churches that cannot afford the tax liability being proposed. Small congregations, downtown with prime real estate, who inherited large buildings from the past. Who fits that description? First Congregational in Sheridan WY. Mainline churches all over this country. The bulk of which are liberal churches who support marriage equality, or are more likely to do so. So to go after the mega churches, you end up hitting hard and closing progressive churches across this country. As a side note, the average protestant congregation in this country has 89 folks in it and 60% of churches have less than a 100 members. Even if you are anti religion can you with ease support a policy that would largely shut down that many churches in this country? Does this fit with the free exercise of religion? C) To pull off taxing churches, besides closing many congregations, you have to have the government be able to audit the books of churches. The separation of church and state is not easily had when the power of the purse spring is being held by the government. But to pull off the $71 billion annual benefit that is being estimated for churches, one is not just including the amount shielded from taxes. One is also including direct subsidies provided to churches in the form of Charitable Choice giving, which started under Bill Clinton. And to make folks on the right unhappy, I believe it should end. To me there is a difference between shielding from taxes and direct subsidy. One is passive, one is active, one simply ignores churches, one is directly propping up their programs. And in this case, it crowds out support for secular non profits, who would not discriminate and who would not proselytize. But it could be asked, doesn’t shielding churches from taxes also crowd out support from secular and state programs? Imagine how many folks we could feed if we actually supported federal and state programs, flushed with new revenue, from the churches? But I offer this question to my liberal friends. If the government had new revenue, do you believe that it would direct resources in that way? Every tea party governor I know is ideologically opposed to state programs that help the poor. Any increase in the state coffers invariably would not go back into social programs. And look at the ideology that reigns in our congress. This is a congress that will not back any new expansion of social services. It certainly won’t fund the government as it is. Would an increase in revenue change that? It’s already happened with a growing economy and there is no indication that new investments are coming down the pike. I’m not opposed to new revenue for local, state, and the federal government. But the presumption that we can close so many churches and then that money would be funneled to poverty programs seems naive at best. I raise these issues because I’m convinced that taxing churches will in fact harm disproportionately liberal churches and the poor. And it paints us on the left as somehow gunning for churches. I think the tax the churches meme hurts the left. Whereas I’m convinced that a progressive renewal in this country will invariably be an alliance of the religious and secular. Rev. Dwight Welch is right on the money (sic) with this one. Yes, there are some “churches” and religious organizations that take advantage of the tax system to enrich themselves. But most, even very large and well known conservative organizations (such as the one I once worked for), are sincere in their goals, beliefs and desire to minister to the needs of others, no matter how distressing we may find their theology and public statements to be. To remove the nonprofit status of religious organizations, as Rev. Welch points out, would be a disaster for most churches in this country. To try and craft new regulations to weed out bad actors is probably not necessary, and would most likely create an even more difficult regulatory landscape for both the public and for those tasked with enforcing such regulations already. Such regulations already exist. What is needed is the ability (and will) to enforce them – which may well require rethinking our tax enforcement mechanisms (not the laws themselves) to make them less susceptible to political pressure.